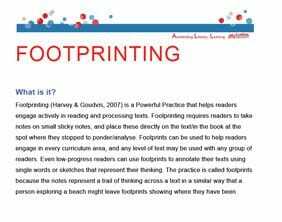 Footprinting (text annotation) is a Powerful Practice that promotes active and engaged reading. 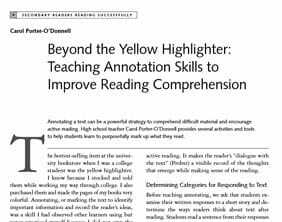 Research tells us that when readers take quality notes about text, or annotate them, they process information more fully and they remember more about what they have read. Footprints is a clever way of enticing students into note-taking. Using sticky notes students annotate texts for a given purpose and then USE those notes to complete a thinking, writing or talking task. This is a great way to encourage students to read text closely and to respond to it personally.